Duck Creek is a busy boating area at Grand Lake. Because of that, GRDA has special boating rules specifically for the Duck Creek arm of the lake. 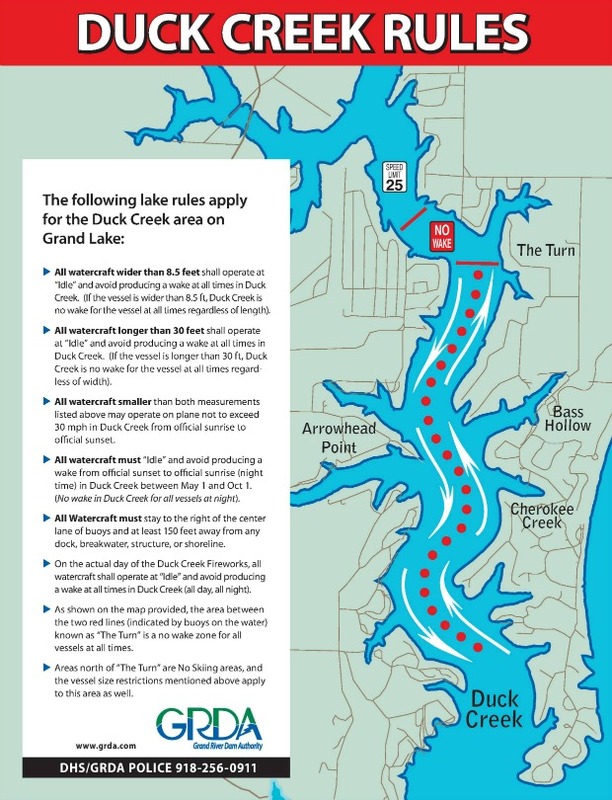 Make sure you are familiar with and follow the Duck Creek boating rules. If you have any questions about these rules, please refer to http://www.grda.com/duck-creek-rules/. All watercraft wider than 8.5 feet shall operate at “Idle” and avoid producing a wake at all times in Duck Creek. (If the vessel is wider than 8.5 feet, Duck Creek is no wake for the vessel at all times regardless of length). All watercraft longer than 30 feet shall operate at “Idle” and avoid producing a wake at all times in Duck Creek. (If the vessel is longer than 30 feet, Duck Creek is no wake for the vessel at all times regardless of width). All watercraft smaller than both measurements listed above may operate on plane not to exceed 30 mph in Duck Creek from official sunrise to official sunset. All watercraft must “Idle” and avoid producing a wake from official sunset to official sunrise (night time) in Duck Creek between May 1 and Oct 1. (No wake in Duck Creek for all vessels at night). All Watercraft must stay to the right of the center lane of buoys and at least 150 feet away from any dock, breakwater, structure, or shoreline. On the actual day of the Duck Creek Fireworks, all watercraft shall operate at “Idle” and avoid producing a wake at all times in Duck Creek (all day, all night). The area known as “The Turn” (area near Harbor’s View and Ugly John’s) is a no wake zone for all vessels at all times. Areas north of “The Turn” are No Skiing areas, and the vessel size restrictions mentioned above apply to this area as well.